+Comment Oracle is refocusing its FS1 storage array into its own public cloud away from on-premises sales. The FSI-2 was introduced in September 2014 as a sort of redesigned Pillar Axiom. It was a hybrid flash/disk array in a rack with dual active/active controllers, fans, power, and non-volatile mirrored cache. It scaled to 912TB of flash, and up to 2.9PB of combined flash and disk capacity. An all-flash FS1 arrived a year later, scaling from 2TB to 912TB. This seemed to be an FS1-2 with its disk drive enclosures taken away and a 30 x 2U drive enclosure scale-up scheme retained. Since then the push/pull effort by Oracle to get its on-premises customers to move to the Oracle Cloud has intensified. This is partly in response to drooping Oracle hardware sales as customers chose commodity-proced competing x86 server/storage kit and partly because of the steady ascent of AWS and Azure into enterprise database processing credibility. Asked about the FS1, an Oracle spokesperson told us: "The product is being internally focused on Oracle’s Cloud moving forward." If Oracle customers are going to move to the public cloud then Oracle wants make sure they move to its own public cloud. This March 2017 chart shows the diverging trends between hardware and the cloud in Oracle's revenues over the past few quarters. At the time, we wrote: "The FS1 flash-based SAN array is going to start meeting competing products using NVMe drives and very fast server fabric interconnects, such as NVMe over fabrics. It also faces a need to operate in a world of server SANs with 3D XPoint storage-class memory or similar tech." 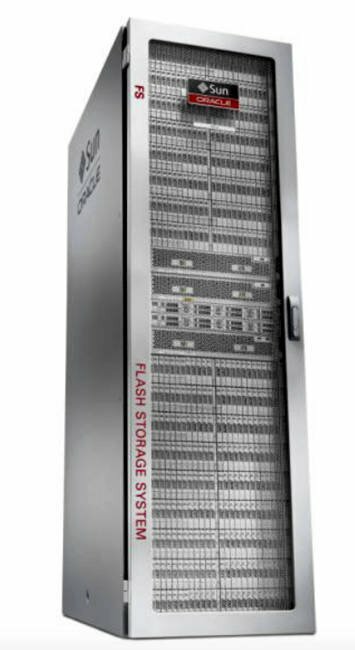 It would appear Oracle has decided to turn away from the on-premises all-flash array competition with the FS1 and refocus it. The product is still on Oracle's engineered hardware products webpage but its "learn more about" details link results in a "We can't find the page you were looking for" message.